Analyst: What could be the potential impact of not having an SEC school in the National Championship? Rebecca A. Jones - Senior Vice President of Merchandising & Marketing: I'm not going to think about that. We're SEC driven. Michael J. Newsome - Executive Chairman: Impossible. Rebecca A. Jones - Senior Vice President of Merchandising & Marketing: With any kind of special event, it's impactful at that point in time, not only because it's a decent amount of volume, but it's also really good at margin. Jones went on to say that the company's sales projections usually take into account all on-field possibilities. Still, there's no question that having the right teams in the championship has a material affect on a regionally concentrated business. For instance, the company said that its Major League Baseball business was "challenging" during the quarter due to the the World Series being in San Francisco and Detroit, neither of which are core markets for the company. In 2011, the MLB business performed better as the chain features more stores in the St. Louis and Dallas areas. For a company that is pushing $1 billion in annual sales, it's interesting to hear marketing execs talk about such a heavy correlation to on-field performance, but it seems that not having an SEC school in the championship could in fact be a material, if temporary, setback for the retailer's stock price, which is up over 100% in the past 24 months. 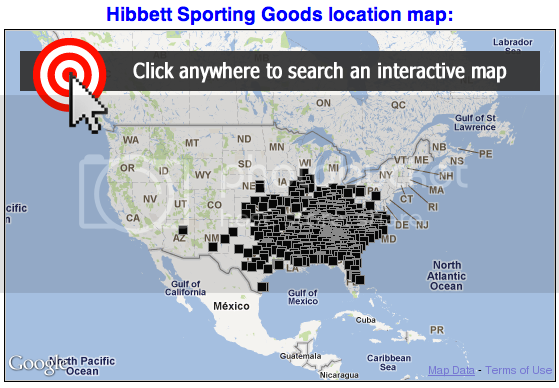 Shown in the store map below, nearly all of Hibbett's 848 stores are spread across the Southeast and lower Midwest so it's easy to see why championship malaise among SEC fans could be a big factor in the company's upcoming quarter. Finally, while NFL is not as big a part of Hibbett's business, pointing to the Saints and Cowboys having off years, Hibbett execs say sales in these local markets are influenced by on-field performance. In the meantime, it's pretty clear who Hibbett execs will be rooting for on Saturdays. Despite taking steps to mitigate risk, according to Jones "wins and losses make a big difference."